Annie and her daughter, both accomplished Urban Land Scouts, sent in this photo of a worm Annie thinks might have come from the Urban Land Scouts debut last April. Hooray for fat worms. 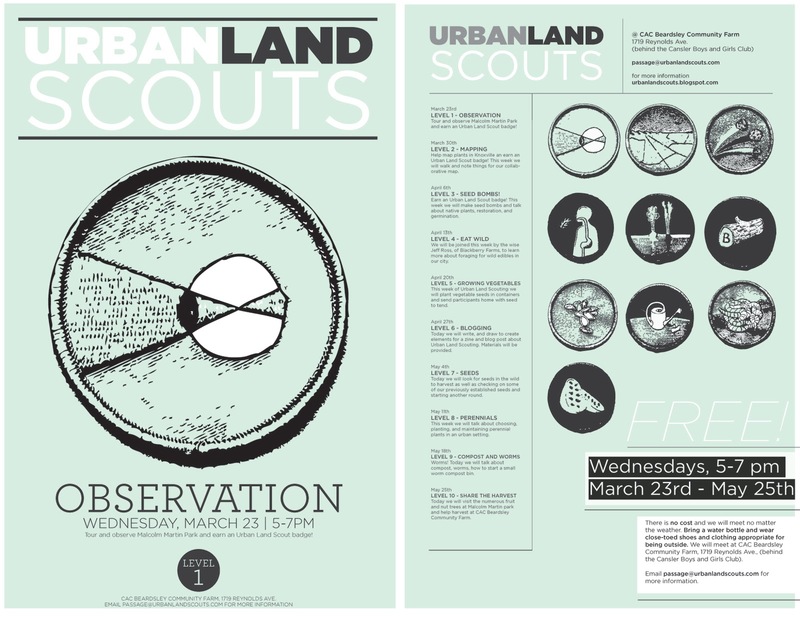 Poster for the first of ten upcoming Urban Land Scout workshops at CAC Beardsley Community Farm. Every Wednesday, from 5-7 pm for ten weeks beginning on March 23rd and ending May 25th. Come one, come all. These images thanks to Rival Collective. Behold, a calendar of urban stewardship-related events in Knoxville. Please re-post and email generously to East Tennesseans and others. Email or comment with events, edits, etc. and will be updated as events are published. Want to add or edit an event? Email passage@urbanlandscouts.com. Learn to make and can your own delicious onion relish. Part of the ongoing series of seasonally-based canning classes at the Birdhouse, Preserving the Harvest. You must pre-register to take this class as space is limited. Cost $10-15 with barter option available. 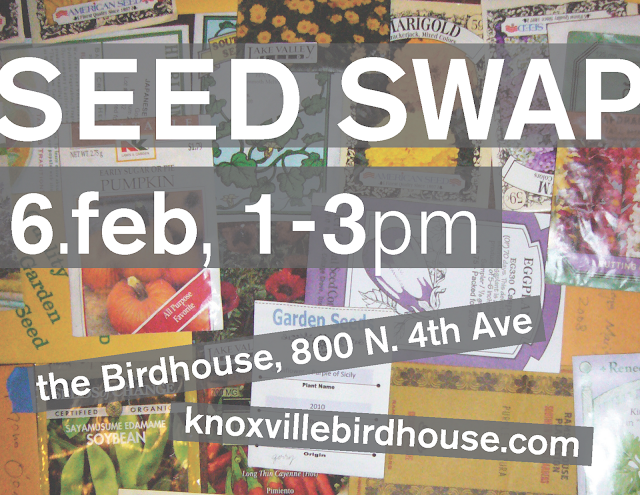 Contact workshops@knoxvillebirdhouse.com for more information. Saturday, Mar. 12 th, time 9-10 workshop, 10-12 working - CAC Beardsley Community Farm, 1719 Reynolds St. behind the Cansler Boys and Girls Center. Meet good folks and join CAC Beardsley Community Farm in tending to their urban demonstration farm in Mechanicsville. Today will begin with a vermicomposting (composting with worms) workshop and proceed to a workday at the farm. FREE! Contact beardsleyfarm@gmail.com for more information. Help the Knoxville Botanical Gardens and Arboretum plant and enjoy their beautiful site. Contact info@knoxgarden.org for more information. Guided tour with Knoxville Botanical Garden and Arboretum garden manager, Brian Campbell. FREE! it home. All materials included. $40/member, $45/nonmembers. Please call Emily Smith at 865-974-7151 or e-mail esmith27@utk.edu to register. March 23 - May 25, Every Wednesday from 5-7 pm at CAC Beardsley Community Farm, 1719 Reynolds St. behind the Cansler Boys and Girls Center. Learn urban stewardship. Each week we will talk about and work towards earning a different badge from the Urban Land Scouts. Topics will include things like observation, foraging, seed saving, and composting. Appropriate for anyone who can cross the street by themselves. Contact passage@urbanlandscouts.com with questions. FREE. Earth Fest - A large event with many vendors, speakers, and family-friendly options. This year’s theme is “Green It & Mean it”. FREE. Blooms Day - Unique garden goods and plants from local growers, live musical performances, garden workshops, children’s activities and more. Admission is $6 and children 12 and under are free! More than 20 workshops will be offered for everyone, from novice to advanced gardeners, covering a variety of gardening topics. Wednesday, May 18th, 5-7 pm, CAC Beardsley Community Farm, 1719 Reynolds St. behind the Cansler Boys and Girls Center. Urban Land Scouts, Level 9 workshop: Composting with Worms - Come work with worm enthusiast, Shannon E. to talk about compost, worms, how to start a small worm compost bin. You can take home your very own 5-gallon bucket for vermicomposting. 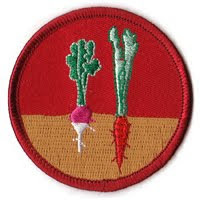 We will meet at CAC Beardsley Community Farm (behind the Cansler Boys and Girls Club) to work on practicing good stewardship and earning Urban Land Scout badges. There is no cost and we will meet no matter what the weather. Bring a water bottle and wear close-toed shoes and clothing appropriate for being outside. Books and Blooms - Join the UT Gardens for nature-themed stories and activities. After story time, the kids can enjoy time under the sprinkler in warmer weather. FREE! Farm Fest - CAC Beardsley Community Farm celebrates the return of warm weather, flora, and fauna. Live music, food and craft vendors, farm tours, and plant sales. FREE! Ijams Fest - IjamsFest is a fundraising event featuring local musicians, artists, and food vendors all on their beautiful grounds. FREE! After seeing Once Upon a Time in Knoxville, a documentary about South Knoxvillian junk-visionary Rollo, my friends and I discussed some of the sweeping statements he made about the state of American culture and the future of the-lifestyles-to-which-we-have-become-accustomed. Rollo is an urban homesteader (on 7 acres in the city...which gives you insight into the kind of urban that we can enjoy in Knoxville) and like many farmers and homesteaders he is an inspired and inventive scavenger. At one point in the movie he makes a brief case arguing the need (and niche) for a scavenging class in the United States. It is old news that we are incredible consumers with little appreciation for the bulk of disposable goods we enjoy. The planned obsolescence of our digital goods renders them almost as disposable as the plastic cutlery we pick up with our take out. Additionally, should you want to cling to your Android or iPhone well into its teens, there is no market for fixing or repairing the thing. Such repairs (or the cost of shipping your phone to the country in which it was made) would cost more than the object itself. Authors and designers William McDonough and Michael Braungart define this problem in their book Cradle to Cradle as a cradle-to-grave mentality. That is, we design products with the idea that they will be "born" out of raw materials, be consumed, and "die" in a landfill. A closed circuit with tremendous costs and wastes. just ripe is a worker-owned food cooperative that's been selling delicious and seasonal prepared food at the Knoxville Farmers' Market on Market Square for over a year now. They're about to take the big step of moving from charming-but-transient-gypsy-caravan to a brick and mortar store in the Daylight Building in downtown Knoxville. As you might imagine, this is an expensive project. In the same spirit that inspires their products and business model, just ripe has launched a Kick Starter campaign. For the uninitiated, Kick Starter is a website that allows people with a vision (like the women at just ripe) to crowd source the funding for said vision. They've set a goal of $12,000 and have until Sunday, February 13th to raise the money. If they don't reach their goal by then, all pledged monies will be returned to the donors. If they do reach their goal Knoxville's food and culture scene will be so much the richer. It is cliche but true to say that every bit helps. Five or five hundred, the women at just ripe will be grateful for your help.